Poverty is a sensitive word on these shores. It’s a word that divides opinions up and down the country mainly because many people believe there is an abundance of food one can’t possibly starve to death in Samoa. That’s easy enough to understand when you look around. And given our poor health statistics when it comes to obesity and non-communicable diseases, it’s hard to say for certain that poverty in terms of food exists. It also perhaps explains why the use of the word is frowned upon so much in some circles. But there is no denying the fact there are other forms of poverty, which are so obvious to the eye. Take for instance the poverty of opportunities to generate incomes for daily sustenance. All you have to do is read the Village Voice Section of your newspaper where ordinary villagers are yearning for opportunities. While we often say we have plenty of fertile land and that we can easily plant our food, in a money-based economy, it is not that easy anymore. Which is why it is so vital that such opportunities for people to improve their lot through income generating initiatives are provided. It’s true that there are lazy people but not all of them are. There are many hardworking people who deserve a little push and a helping hand to advance their lot in life. This is why an initiative launched last week by the Samoa Commercial Bank (S.C.B.) is so exciting. From what we are told, the Small Development Loan Scheme for the Low Income Earners (S.D.L.S.) aims to increase productive investment, productivity of low-income families, employment, export which will ultimately improve living standards. The best part is that the scheme is designed to cater for some of the poorest people in this nation today. The man behind the scheme is S.C.B’s Managing Director, Lemalu Ray Ah Liki, who obviously has a clear vision to help the least fortunate members of this community. Said Lemalu: “The Loan Scheme is not aimed exclusively for the rural and farming community. According to Lemalu, the Scheme is the bank’s way of helping those who struggle to get funds. “This is for families who have problems getting loans from anywhere else because of the strict criteria,” he said. “They have no source of income but they do have the ability to work on vegetable stalls or taro stalls and they would like to enlarge their activities. “This is the assistance we could provide for them. Shareholders are securing these loans so they don’t need to look for anyone to guarantee the loans. Lemalu added that the whole idea is to make the lives of low or no income families a little easier. We talk so much about providing opportunities and an enabling environment for people to flourish and yet we don’t give them the means to do that. Here with this initiative, it’s not just an invitation to flourish, people are also being given a little push to help them on their way. It’s about bridging the gap between the haves and the have nots. It’s about providing an enabling environment to allow people to start small and let them realize that the sky is the limit. We acknowledge with gratitude Lemalu and his team for the foresight and the willingness to break the norms in terms of the usual bank lending criteria to provide help at a time when it is most needed. But here’s the thing. 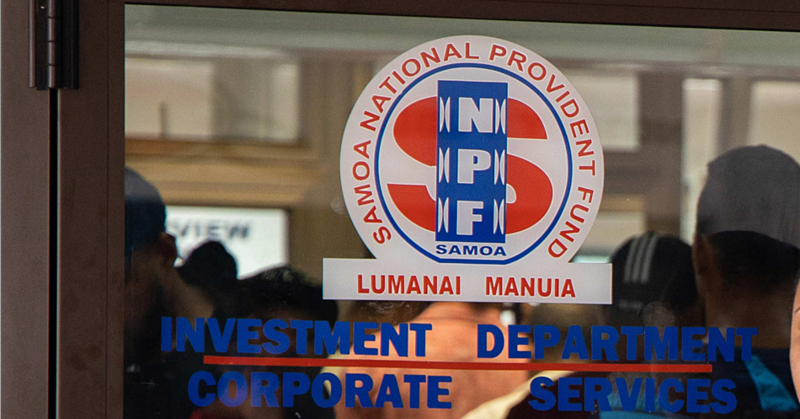 Now just imagine for a minute if the Samoa National Provident Fund will come up with a similar scheme for everyone in this country. Imagine if the government would recover all those millions wasted on those white elephants, corruption and reckless investments so they could do what the Samoa Commercial Bank is doing? Just imagine the possibilities.